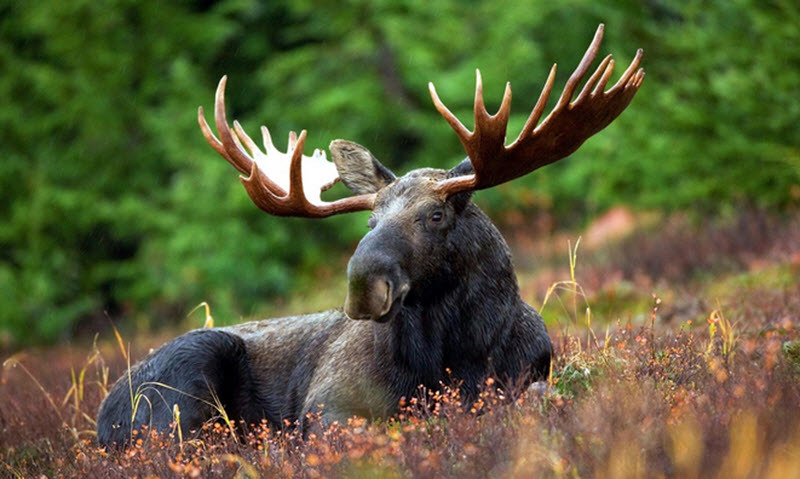 The distinctive moose is the largest member of the deer family. It is characterized by its heavy body, long legs and rather long yet dropping nose. Only the males have antlers, and these can be massive, making them excellent for trophies, particularly at around ten to twelve years of age. Typically, these animals are a brown to black colour and can weigh in excess of 650kg, making them a formidable prey animal. Moose live in the northern states of America and also in Canada, and there are European Moose as well, which can be found in the Scandinavian countries and Russia, where moose hunting is also a popular pastime. Moose hunting is a rather popular pastime, particularly in the United States. There are various subspecies of moose to be located throughout the northern states, each with their own terrain to traverse and other hardships in the hunt. For many people, the moose is considered a bucket list species, not because it is not fun, but once is usually enough to call it a day. For many hunters though, it is a hard process trying to determine where and when to hunt a moose. Not all states across Canada and America have access or even allow hunting, and for some the size and hardiness of the moose in question will also come into play. The following will outline just a few of the areas to be aware of when it comes to hunting moose in North America. Shiras moose are found in the Rockies and is the smallest of the species. It is very hard to get a permit for one. Utah, for example, does offer tags but they will cost a fair amount, with a hunt often costing upwards of $17,000. These hunts also require hunters to be physically fit due to the terrain. Maine or Canadian moose are also hard to draw. Getting a tag can mean a hunt costing around $4,500, though this can still be much higher. Moose in Canada are generally seen to be separated into three sections, with east of Saskatchewan being smaller and costing up to $7,000. Often these hunts have been known to offer poor results, so it is important for prospective hunters to check out all aspects before booking a trip. Alberta is a rather more agricultural area and often has restrictions on the number of hunts and size of the bull. The cost of one of these hunts is similar to Saskatchewan, though the terrain is not so difficult. However, it is in British Columbia that most would find the best hunt. Here the hunting is remote, and the moose bulls are large. The further north you go in the state, the more remote the hunt and the higher the chances of snagging a really big 60-inch plus bull. However, the price will match, with hunts ranging from $10,000 to $14,000. No matter where the hunt takes place however, there is still the thrill of the chase, the beautiful scenery to enjoy and excitement of seeing such a magnificent creature up close.